Histomount is effective with most clearing agents when used as a liquid cover slip or as a permanent mounting medium for traditional glass cover slipping. A dip stick providing an optimal amount of Histomount is provided with each 100ml bottle. for mounting and preservation of microscope slide specimens. Total control over dispensed drops. No change in density. Mount-Quick dries quickly with high transparency and no bubbles. It will not fade or deteriorate. It is soluble in xylene. Uniquely used as a tissue transfer medium. See Technical Note for details. Instant - they are thermal mountants and require "no oven time"
Fluid - at 65°C - a temperature chosen because it makes a permanent mount and protects the majority of specimens from thermal changes. At 60° to 85°F. Meltmount is meant to be thermally reversible, don't allow this to happen inadvertently by storing or transporting prepared slide above 85°F. Cargille Meltmount™ is now available in a convenient stick form called Quick-Stick™. It can be used to make permanent microscope slide mounts quickly. Quick-Stick™ can be applied to a slide on a hotplate. As soon as the specimen and cover glass are positioned and the slide is cooled, you have a permanent prepared slide that can be reversed by reheating, if you should wish to retrieve a particular particle. Meltmount™ 1.539 has a refractive index (nD @ 25°C) of 1.539 and an Abbe V dispersion of 45 making it optically similar to Canada Balsam and, therefore, ideal for mounting many biological specimens but without the long drying time of Canada Balsam. Meltmount™ for Chrysotile Asbestos has a refractive index (nD @ 25°C) of 1.550 and has dispersion characteristics making it appropriate for mounting chrysotile asbestos. Meltmount™ 1.582 has a refractive index (ND @ 25°C) of 1.582 and an Abbe V dispersion of 33. Its optical clarity makes it the preferred choice for minimum visible absorption. Meltmount™ 1.605 has a refractive index (ND @ 25°C) of 1.605 and an Abbe V dispersion of 30, making it appropriate for mounting asbestiform Tremolite, Anthophyllite, and Actinolite. Meltmount™ 1.662 has a refractive index (ND @ 25°C) of 1.662 and an Abbe V dispersion of 26, optically similar to Aroclor 5442, but is PCB-free. Meltmount™ 1.680 has a refractive index (ND @ 25°C) of 1.680 and an Abbe V dispersion of 25, making it appropriate for mounting Amosite and Crocidolite asbestos. Meltmount™ 1.704 has a refractive index (ND @ 25°C) of 1.704, similar to naphrax, and an Abbe V dispersion of 24. Mount-Quick Aqueous, a water-based mounting media, has been developed for use with lipid sections, immunohistochemical stained sections and AEC method stains. Available in 30ml dropper bottle. SHUR/Mount Aqua-Poly/Mount, designed for coverslipping slides directly from water. As it is water based and non-fluorescing, it is applicable for immuno-fluorescent techniques as it enhances and restains fluorescent stains. Fluoromount-G - A water-soluble, non-fluorescing mounting media for cover slipping slides after a staining procedure with an aqueous final step. This mounting media will have a semi-permanent seal for long-term storage. 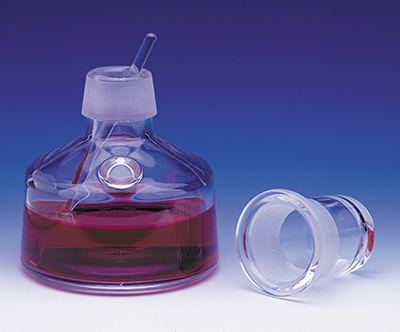 Fluoromount-G may be used with cell preparations and tissue sections. Citifluor provides a range of antifadent mounting media which greatly reduces the fading of the fluorescence from FITC, rhodamine, Hoechst, Alexa, Green Fluorescent Protein, cyanine dyes, Texas Red, and phycoerythins. A range of antifadent mountants are available in either glycerol based or glycerol free solutions. Citifluor mountant can either be permanent (hardening) or not (non-hardening) depending on your labeling requirements. The use of fluorescent labels and markers is now widespread and immuno-fluorescence, which relies on the use of antibodies tagged with labels such as fluorescein, is a well-established technique. 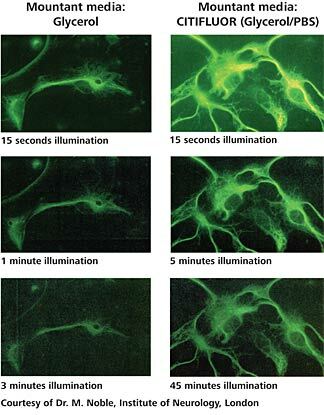 A common problem associated with the microscopical examination of these materials is that the illumination used for stimulating the fluorescence also causes degradation of the label and this causes fading of fluorescence. This also is a problem when trying to visualize materials having a low level of labeling. 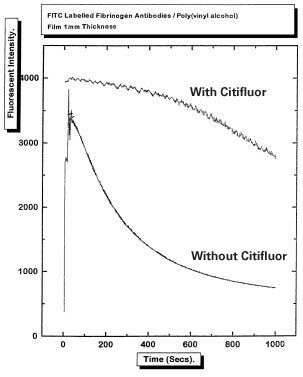 The photofading of labeled materials can be retarded by the use of the Citifluor mountants. The antifadent solutions AF-1, AF-2 and AF-3 were specifically developed for use with FITC polyclonal antibodies but their use is now far more widespread. They show improved signal preservation with many other fluorochromes including rhodamines and DAPI. AF4 contains the antifadent propyl gallate, which is particularly suitable for use with DAPI and Alexa dye-stained materials, as well as FITC-labelled materials. AF-1 - Glycerol-phosphate buffered solution containing antifadent for use with labeled tissue and dead cells. Available in two sizes. Contains anti-fading solution. Suitable for preventing fading of dyes such as DAPI which have the tendency to disperse in glycerol based mounting solutions.